Examples, solutions, videos and lessons to help Grade 8 students learn how to analyze and solve pairs of simultaneous linear equations. A. Understand that solutions to a system of two linear equations in two variables correspond to points of intersection of their graphs, because points of intersection satisfy both equations simultaneously. B. Solve systems of two linear equations in two variables algebraically, and estimate solutions by graphing the equations. Solve simple cases by inspection. For example, 3x + 2y = 5 and 3x + 2y = 6 have no solution because 3x + 2y cannot simultaneously be 5 and 6. C. Solve real-world and mathematical problems leading to two linear equations in two variables. For example, given coordinates for two pairs of points, determine whether the line through the first pair of points intersects the line through the second pair. I can identify the solution(s) to a system of two linear equations in two variables as the point(s) of intersection of their graphs. I can describe the point(s) of intersection between two lines as the points that satisfy both equations simultaneously. I can solve a system of two equations (linear) in two unknowns algebraically. I can identify cases in which a system of two equations in two unknowns has no solution. I can identify cases in which a system of two equations in two unknowns has an infinite number of solutions. I can solve simple cases of systems of two linear equations in two variables by inspection. I can estimate the point(s) of intersection for a system of two equations in two unknowns by graphing the equations. I can represent real-world and mathematical problems leading to two linear equations in two variables. 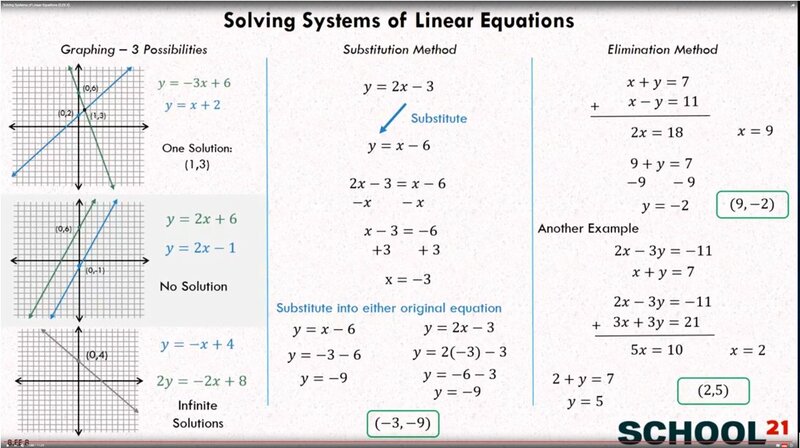 The following table shows examples of solving systems of two linear equations in two variables algebraically, and estimate solutions by graphing the equations. One solution, No solution and Infinite solutions. Solve using the substitution method. Solve using the elimination method. 1. Sheila's age and her dad's age add up to 63. 5 years ago, Sheila's dad's age was 1 less than 5 times Sheila's age. What are their ages now? 2. For a guacamole recipe, you buy 3 lb of avocadoes and 2 lb of onions, which costs you $18 total. Your friend has a different recipe, so he buys 4 lb of avocadoes and 1 lb of onions for $19 total (at the same store, at the same per pound prices). Find the avocado price per pound and the onion price per pound. This video discusses the characteristics of solutions of linear equations that have one solution, no solutions, or an infinite number of solutions.